This classic video speaks for itself. Facenda's narration combined with the quick cutting and heroic music laid on thick for the great Johnny Unitas it doesn't get any more theatrical than this. I always liked the music that was used at the beginning of this video (0:26) when an ailing Unitas comes in for the second half of Super Bowl III and begins to lead the struggling Colts forward. That piece of music was not composed by Spence but by Jack Trombey. Figuring out who composed what for these old videos takes a bit of detective work, but it's nice to see that there are others who are into this stuff as well. Pissed that it wasn't included on the cd! Other than the iTunes offerings I don't think any of the Hedden and Robidoux material were available as pressed cd's. Perhaps at one point there were cdr's offered but I'm not sure. 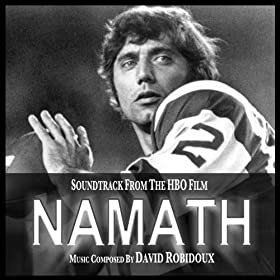 Robidoux's scores to HBO productions like "Hard Knocks", "Lombardi", his "America's Game", and his recent "Namath" HBO documentary score were released as downloads. Did they show the original clips full-frame or cropped for 1;78. "Dodge City" by Jack Trombey goes off into Bonanza territory a bit as it moves along but the first half of the piece is the obviously what they wanted. Some of the fun of Autumn Thunder is picking out the "tracked" or "sourced" music. . I compiled a list from POWER AND THE GLORY. Shall i make it public? Used in the Minnesota Vikings vs. Pittsburgh Steelers Super Bowl IX highlights film. I can't help but be reminded of a scrambling for his life Vikings quarterback Fran Tarkenton desperately seeking targets downfield against the vaunted Steelers "Steel Curtain" defense. Martha Jane Weber - "Action Man"
Martha's contributions on NFL Films often get overlooked (Most people probably will think it's Spence) but she proved she could write "music with hair on it" every bit as good if not better than some of the men. Four of her contributions are contained on the first two discs of the "Autumn Thunder" set. Not that it matters but out of curiosity, does anyone know for sure if Martha Jane Weber was a pen name for another person named Weber and if Beverly Herrmann was also a pen name for William Soden? PS - Glad to see this thread revived! Thanks! While this thread is going well amid the discussions of artists such as Spence, Trombey, Weber, etc., I'd like to ask for help. I greatly enjoy the work of William Loose which was used for NFL Films, particularly in the early 70’s. Of course his work also appears on NOTLD, Ren & Stimpy, the Russ Meyer films, etc. There are numerous tracks on youtube which are attributed to Loose, but I would like to know the original source(s) – Capitol, De Wolfe, etc., and the availability of such. Here are a few favorites. If anyone can direct me, I’d much appreciate it. It's been a fun thread. Nice to see all the recent responses here. While my post above was a bit tongue in cheek, I've heard that question asked before. It is curious that there is next to nothing (not even a small bio or a few photos) on the net that can be found on either of these two people. The fact is that both Weber and Herrmann are credited along with Spence (and others) on both the original series of NFL Lp's and the Autumn Thunder set as composers and producers. That's what we have. Through the decades Weber and Herrmann seem to have dropped off the face of the earth while Spence remains the composer that continues to be most associated with NFL Films. Sam Spence - "Forge Ahead"
Another selection from Spence that was used in NFL highlight shows from the early 80's. Ooh, hadn't heard that one. It's a lot of fun - Kinda reminds me of John Scott's FINAL COUNTDOWN theme. I finally found the name of the cue that plays most memorably during the Cowboys' Super Bowl XIII comeback attempt. The cue is called "War Footing" and the composer is Jack Trombey. It's been a favorite of mine for decades yet I never knew the name of the cue or its composer. It works brilliantly alongside the images and the cue itself sounds like Stravinsky composing a Western score. Was listening to Bill Conti's THE RIGHT STUFF the other day, and heard what I thought would be a fine cue for an NFL Films highlight reel. Skip ahead to 1:01 of "Yeager and the F-104" and try not to picture a slo-mo shot of a running back breaking tackles and then galloping off to the opponent's end zone, with John Facenda's legendary voiceover narrating the glory of it all. Conti was always so damned good at composing for sports, even when he wasn't. Yeah, that's perfect for an NFL reel. Though this track annoys the hell out of me because Conti reversed the music. On the soundtrack he starts with F-401 climbing into the stratosphere then cut's backwards of the F-401 taxiing onto the runway. Those who watched THIS WEEK IN BASEBALL will remember this theme, which played over the end credits of each episode. I associate this theme with that program and was unaware that it was for NFL Films. This reminds me: In the liner notes for "North Dallas Forty," Scott mentions that the producer admired a theme he wrote that was used for the New York Knicks. Anybody have any idea what theme that is? As an avid Knicks watcher around that time, I'm sure I'd know it. This was the New York Knicks TV theme from 1979. A very recognizable tune if you lived in the NYC area back then and watched the Knicks games on television. The video poster credits it to John Scott. I never knew it was John Scott all those years ago. The memories flood back. Both good and bad. The legendary Earl "The Pearl" Monroe was still playing on the team. And you had the "Twin Towers" Marvin Webster and Bill Cartwright. Not to mention Ray Williams and Micheal Ray Richardson. Here's the theme from the UK sports TV show World of Sport, which was used between 1968 and 1983, and was composed by Don Harper. Certainly has that NFL Films sound. Indeed it does, in some parts of it, anyway. Thanks for posting it. I never noticed, but then I don't require a soundtrack to always ape the film order. My God, those 70's hairstyles were hideous! This is news to you? Friggin' millennial. Welcome to the '70s, pal. "The past is a foreign country. They do things differently there." Yeah, comb-overs are hideous, whatever the decade, yet they never seem to go away. Is there a thread in there - "Comb-Overs thru the Decades"? Hair helmets do not always mean combover and vice versa. Plenty of guys back then sported a full, healthy head of hair. It is disconcerting to see seemingly every single man with some sick variation of the "hair-helmet-and-muttonchops-combo" hairdo. It's as though it were required. Longish hair on men would linger until perhaps the mid 1980s, when men's hair shortened considerably.